The Mary Meeker Internet trends 2014 annual report came out in late May, and as usual it sheds a lot of light on how emerging technologies are changing the world around us. Weighing in at more than 160 slides, there’s a ton of information to digest from the report, so I’m going to concentrate on just a few of the high points. 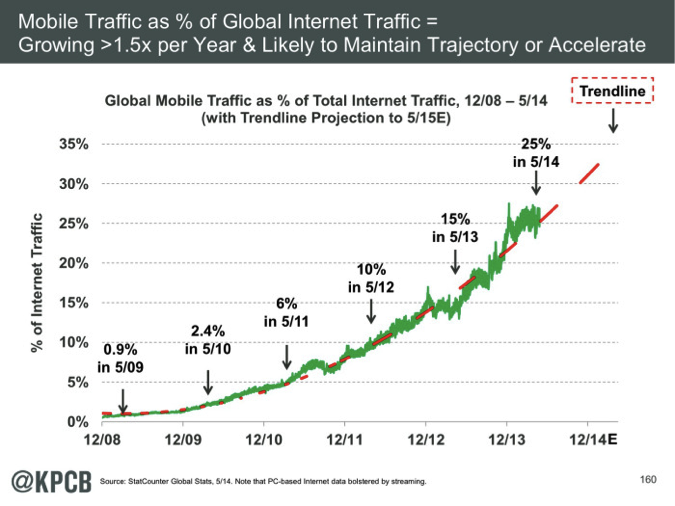 Mobile traffic as a percentage of total worldwide Internet traffic reached 25% recently, a remarkable stat considering that mobile accounted for less than 1% of traffic just five years ago. Meeker, former analyst at Morgan Stanley and now a partner at Kleiner Perkins, cites strong growth in video traffic to mobile devices as the key driver of this trend, but it appears that surging growth in mobile devices themselves is an important driver also. Smartphones and tablet PCs together are flying off shelves at a simply astonishing rate, continuing a trend we first blogged about back in 2012. What really jumps out is how mobile is bringing the Internet to far larger numbers of people than the wired / desktop model did in the 1990s and early 2000s. 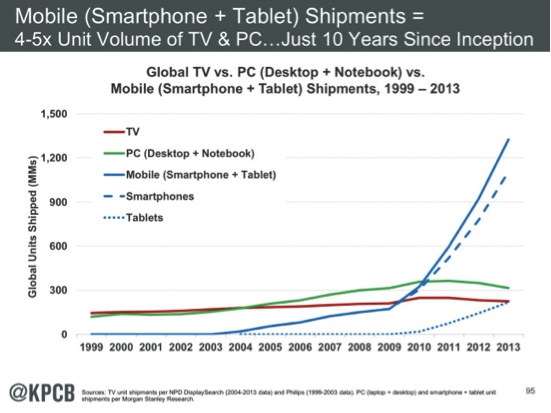 Moreover, it is now quite clear that the TV is no longer the most important screen for most of us. Taken together, PCs, smartphones and tablets have our attention for many more minutes of the day than does the TV. 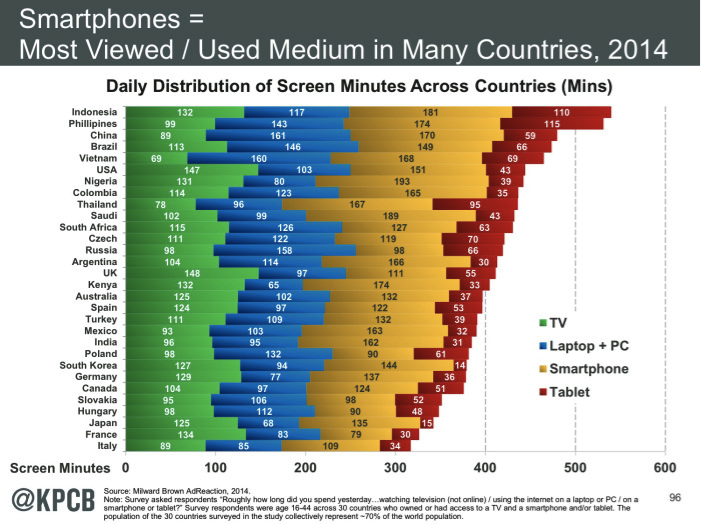 In the US, people spend around 300 minutes per day looking at their PCs or mobile devices vs. around 150 minutes per day watching TV. The implications for marketers are, obviously, enormous, though it’s not yet clear that the nature of this sea change has sunk in with brand advertisers, media strategists and engagement specialists. Seven years after the debut of the iPhone, and four years since the debut of the iPad, it seems like we’re still in the early days of the mobile revolution. Learn how leveraging on mobile can improve your customer engagement with the Forrester Go-to Guide for Mobile Engagement webinar.